Perched on a mountain in Bat Cave, this mountain cottage offers desirable views of Chimney Rock and echoes the music of a roaring creek. Step out onto one of the two level decks, relax, and enjoy a cup of coffee while taking in the sight and sounds. This home would make a spectacular mountain get-away, but you might find yourself never wanting to leave, it is that serene. If you find yourself itching for adventure, you are 5 mins from Chimney Rock, not even 10 mins from Lake Lure and 20 mins from Hendersonville. New kitchen appliances will be delivered and installed within days of being listed. 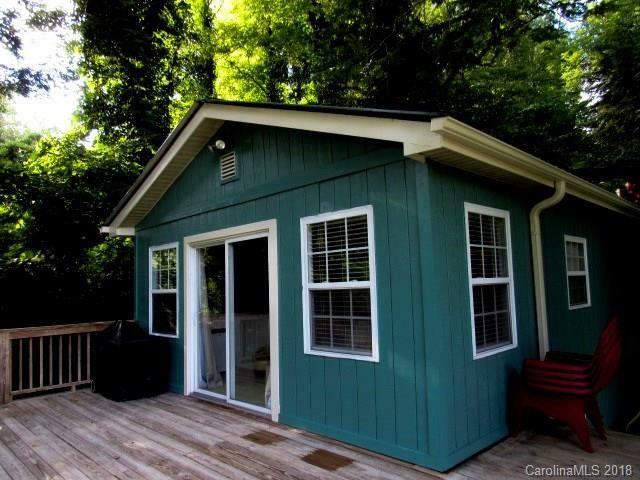 Come find the peace and relaxation you've been looking for in this Bat Cave Cottage perfect for the second home getaway, downsizing & possible rental income. Home has a slight encroachment on old easement road. According to Henderson County Planning Board & 2007 Development Code home is grandfathered and is not in any violation of the county. The easement is owned by the sellers to the center.